“While one may expect an outdoor type like the Ranger high up in a tree, or tracking some foe across a dusty plain, it is equally common to find them frequenting their local Public House (or wherever ale is served). For it is there that they pick up the work, and the skills, to track the most dangerous animals of all.” – The Emperor’s Guide to Thandar. 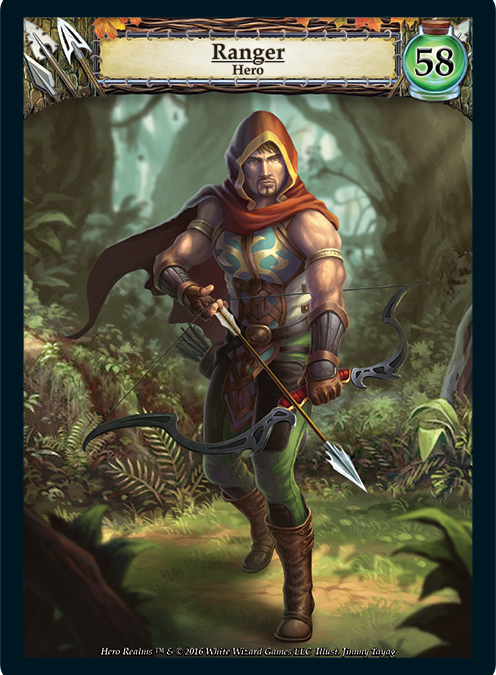 The Ranger is an interesting and fun Character to play, since the starting deck doesn’t suggest an immediate strategy. As a ranger, you must be good at a wide range of abilities. Maybe that’s where we get the name “Ranger” from? The deck itself has some built-in card drawing that serves very well. 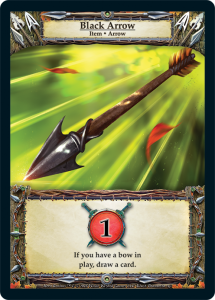 Your Black Arrow cards will draw you a card for each one played as long as you have already played a Bow (though you need to remember to play the bow card first). Also abilities such as Track mean that thinning your deck with the sacrifice ability isn’t as crucial. “The least dangerous ranger is a visible one. When they vanish, they intend to strike.” – The Emperor’s Guide to Thandar. 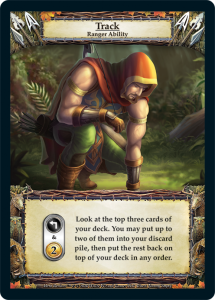 Track is a great way to sift through small-scale Gold cards and get to the good stuff in your deck. 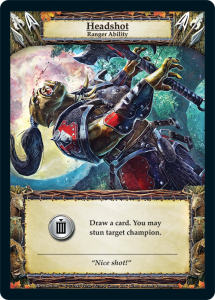 The Track ability can be used as a gold dump to set up your next turn, or to get something into your discard pile for an easy sacrifice. But if you use it in conjunction with Headshot (or any card-drawing ability), it becomes amazing. 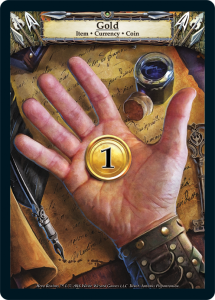 Use Track to put a card you need RIGHT NOW on top of your deck, and draw it immediately. This could be the difference between a hard-won victory, and a shameful defeat. “The movements of Rangers are difficult to predict. Their skills were learned through family and other mentors rather than from a book. They will find what they wish to find, and be found when they wish to be found.” – The Emperor’s Guide to Thandar. 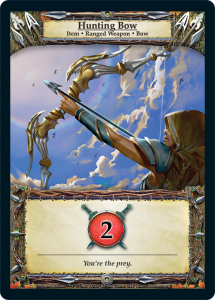 As always, the single Gold cards will be prime targets for Sacrifice, but pay attention to the buying power of your deck! The Ruby makes 2 Gold, and the Horn makes 1 but also makes the next Champion you purchase 1 cheaper, so it’s effectively 2. 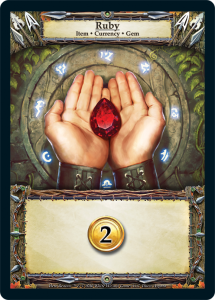 This means a starting 5-card hand of Ruby, Horn, and 3 Gold will net you a 7-cost Champion. The Ruby will often stick around to power your Track ability. 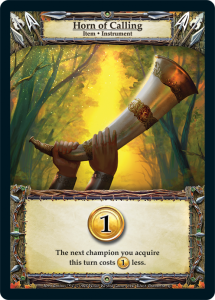 Once your deck is nice and thin, and you can see your victory on the horizon, the Horn will start to lose its appeal. We don’t have Hobbits in Hero Realms, because we have Black Arrows. The card-drawing combination of the Black Arrow cards and the Hunting Bow is pretty explosive. The Market Deck doesn’t contain any Bow cards, but if you end up with a fast-paced deck that draws a bunch of cards, consider keeping the Ranger weapons as long as you can. 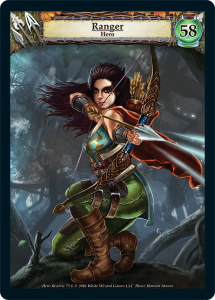 “Overall, it’s best to not worry about being hunted by the Rangers of Thandar. If they want you, they will get you.“ – The Emperor’s Guide to Thandar. The Ranger Deck is a little advanced. It has good utility to keep the pressure on your opponent, and allows you to maximize your chances of victory. Track early and Track often!